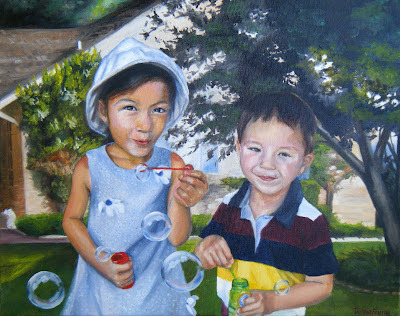 Destany Fenton Fine Art and Portraiture: Blowing Bubbles! This was a real treat, I have been on another break as I learned to embroider and to knit! I broke my hiatus when commissioned to paint a portrait of these two lovely kids! After contacting me, the mama brought them over and I was able to discuss the concept with her while our kiddies played. I took some pictures, and through the course of a couple weeks, the mama also sent me some and we had another playdate. These truly are sweet children! This painting is 16" x 20" Oil on canvas, and aptly named "Blowing Bubbles".